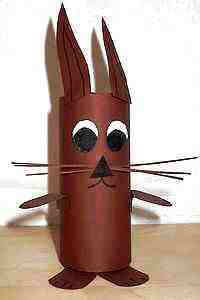 In order to make the rabbit, a toilet paper roll is covered in coloured paper first of all in the colour desired (e.g. brown, black or white). The ears, arms and legs are then drawn onto coloured paper and are cut out. The inner parts of the ears are then drawn with a black felt tip (the inner ear can also be made from a piece of coloured card which is stuck onto the ear) and are then stuck onto the outside of the centre roll. In order to define the paws better, little lines are drawn and are then also stuck onto the roll. The arms are now stuck to the outside of the middle of the roll at the left and right and the legs are stuck the inner part of the bottom of the roll. Only the rabbit’s face is missing now. The eyes are drawn onto white coloured paper and the pupils are drawn with a black felt tip pen. The eyes are then stuck to the roll. A little triangle is now cut out from black coloured paper. With the help of three of four very thin pieces of black or brown coloured paper, the triangle and strips form the nose and whiskers to make what can now be recognised as a rabbit. The little mouth is then finally drawn on the rabbit with a black felt tip. The finished rabbit feels at home in an Easter nest at Easter time.